Before I start, I have to state that the technique shown in this post isn’t mine but was developed by my colleague Andrew Simmans, who has very kindly allowed me to blog about it. To complicate matters, each product has one product manager but product managers for particular products change from time to time. Normally this might be solved by adding the product manager name to the Product dimension table and implementing a Type 2 Slowly Changing Dimension. In this case, though, we want something slightly different: instead of seeing sales attributed to the product manager who was in charge of the product at the time of the sale, and therefore seeing sales for the same product attributed to different product managers on different dates, we want to attribute all sales for a product to a single product manager but be able to use a second date dimension to be able to determine the point in time, and therefore the product manager in charge of each product at that point in time, that we want to report as of. To put it another way, we want to be able to find the state of a dimension on any given date and use that version of the dimension to do our analysis. Many-to-many relationships, in this case the solution developed by Gerhard Brueckl, described on his blog here. ‘Between’ date filters, which I wrote about recently but which Alberto has recently improved on in his must-read white paper here. 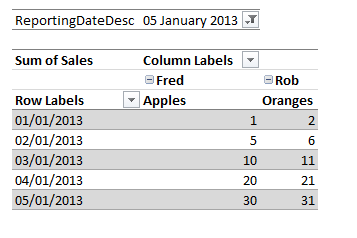 I’ve added a second date table called ReportingDate which contains the same rows as the Date table shown above; note that it has no relationship with any other table. This problem is very similar to a many-to-many relationship in that a product can have many managers across time, and a manager can have many products. Indeed we could model this as a classic many-to-many relationship by creating a bridge table with one row for each valid combination of product and manager for each possible reporting date; on my project, however, this was not a viable solution because it would have resulted in a bridge table with billions of rows in it. 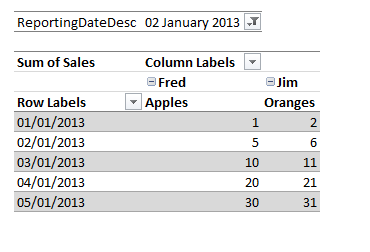 Therefore, instead of joining the ReportingDate table directly to the ProductManager table, we can instead filter ProductManager using the between date filter technique. You can download my sample workbook here. Do you have a sample workbook that can be opened in Excel 2010? When I tried to do anything with the PivotTable or open the PowerPivot window I was told that the PivotTable/Data Model was created in a newer version of Excel and can’t be updated in this version of Excel. we have a POC to implement a cube with sales amounts as a fact with different dimensions such as customer age, and the sales person Id. then the supervisor or a manager should query this cube through a performance point report and he should see only the sales amounts related to the sales employees under his umbrella, any directions please how to address this in designing and implementing the cube and the report? Sounds like dimension security should do what you need. If you have a lot of managers then you may need dynamic dimension security. Jg would be grateful if I could get some help. I want to be able to produce the number of active rows per month / year over a period of time. I have start dates and end dates. in some cases there is no end date, it is empty.